How is your hay fever? I am writing this on a beautiful sunny Spring day. I'm OK because I filled up on antihistamines this morning. 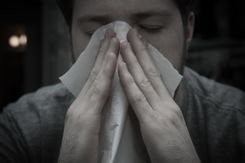 Hay Fever, or Pollen Allergy (or Seasonal Allergic Rhinitis) is caused by the body's over reaction to pollens which are harmless floating packets of plant tissue. This reaction causes runny nose, itchy, red eyes and scratchy skin depending on where it lands and where your sensitivities are. It can even cause mouth itching and nausea with certain foods - Oral Allergy Syndrome or Pollen Fruit Syndrome. ... And it's really bad for teenagers!...especially at exam times. 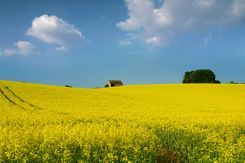 Warning... Rapeseed, those beautiful fields of yellow flowers, give off a pollen which can cause an irritating nose reaction to anybody - EVEN IF YOU ARE NOT ALLERGIC. Not all Spring & Summer sniffing is allergic. 2. Stop your body's immune system reacting to it. This is really tricky because pollen gets everywhere. It helps if you know what pollens you are allergic to so you need to make sure that you have had some allergy testing before you change your whole lifestyle! 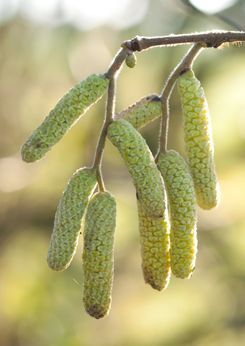 From Trees such as birch and willow - the ones with catkins on. Catkins are bags of pollen! Stay away if you are allergic. I have chopped down the willow in my garden. These trees give off pollen early in the season before the plants leaves have come out usually in March in the UK but sometimes sooner. These trees flower/blossom later on in the season. Tree pollen levels tends to be worse in the evening. Tree pollen floats upwards in to the sky during the day and then falls back down to Earth again in the evening as the temperatures fall. If you have Tree Pollen Allergy, make sure that your windows are closed and your washing is off the drying line by teatime. This tends to come on later in the season (SUMMER) and is more difficult to avoid. DON'T cut the grass. DON'T sit on the grass. DON'T dry your clothes or bedding outside at all in the Summer. Stop your body's immune system reacting to it. Firstly, take a good antihistamine - preferably one which doesn't make you drowsy. Loratidine and Cetirizine are both generic drugs which would be suitable and which are suitable for most children over one year of age. you can get these from your GP, or over the counter at chemists, supermarkets or even newsagents. Secondly, look after your nose. My first choice would be a Steroid nose spray (beclometosone) which is widely available and effective but kids don't like it much. Persevere. You can get nose sprays which do not have steroid in them (cromoglycate) which can be effective too. Thirdly, try some eye drops (cromoglycate). Again, younger kids can be a little non-compliant with these but they can be very effective too. Fourthly, if you are also taking asthma medication (inhaler or Montelukast) make sure that you keep up with these also. Finally, if you have tried all of these - and I mean really tried all of these - you could try Pollen desensitisation, sometimes called immunotherapy. This involves dissolving a packet of grass pollen or a spray under you tongue (sub-lingual) every day for three years. It is very safe and very effective. There are a several types to choose from such as Grasax and Oralair.